Bloodborne Producer Masaaki Yamagiwa says that 30 FPS is the best framerate to play action games in. Update: Yamagiwa has stated via Twitter that the "30 FPS is the best framerate to play action games in," quote from the PlayStation Lifestyle interview is a misquote/translation. "We are to assign 1080p/30fps for Bloodborne considering its game designs, but didn't say it's the best choice for all action games," he said. Original Story: If you're the kind of gamer who loves the silky smooth gameplay that only 60 FPS can bring, you've no doubt been disappointed by announcement after announcement that upcoming next-gen games will be capped at 30 FPS. 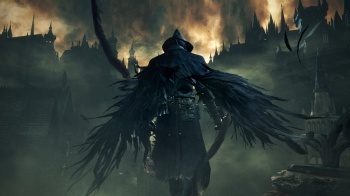 While the usual excuse is simply "the hardware can't handle it," (often reworded to, "we decided to spend system resources elsewhere") this time, Bloodborne producer Masaaki Yamagiwa has told us that his upcoming title will most likely be capped at 30 FPS because it is, according to him, "the best" framerate for action games. "[We] haven't made an official announcement yet," Yamigiwa told PlayStation Lifestyle, "but they will probably go for 30fps since that's what they found to be the best fps (frames-per-second) to play action games." He also added that "they weren't targeting 60 FPS because it's not a first-person shooter, it's an action game," implying that the only games that benefit from 60 FPS are shooters. Yamigiwa is certainly throwing some more fuel onto fire of the debate surrounding next-gen resolution and frame rate, and stating that the 30 FPS benchmark was a deliberate decision rather than a hardware limitation doesn't exactly help his argument. What do you guys think? Is 30 FPS really the best for action games, or would you go higher if you could?